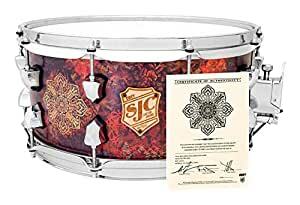 You can own a piece of SJC history and support a good cause with your purchase of an SJC Frank Zummo OBEY snare drum. These collectible snares, limited in number to only 25 worldwide, are a labor of love between Frank Zummo of Sum 41, Shepard Fairey of OBEY Clothing, and SJC Drums. A portion of every purchase goes to support Flea’s Silverlake Music Conservatory â a pay-what-you-can organization that provides music lessons to kids.